Finally - five years search is over! While eating breakfast, we (Charlotte, Bill and I) talked about what to do on this day, as the only thing that was decided already was that we were going to the Forest Edge Amphitheater in Fort Hamby Park outside Wilkesboro in the evening to see the play "Tom Dooley - A Wilkes County Legend", where Chalotte and Bill would also try to sell some copies of Charlotte's excellent book, "The Tom Dooley Files”. Bill suggested that we visit Zelotese Walsh, who we also visited last year, and I readily agreed, as I found him very interesting. So we decided that Bill should call him and find out if he was home, which he was. We therefore arranged to be at Zelotese’s place at 11 am. Since 2013, I have been looking, both alone and with Tim, for a particular small family cemetery where a couple of people, very peripheral to the Dooley case were supposed to be buried, but so far without any success. We had tried using GPS combined with coordinates we had found on the web, maps and pictures, but none of it had helped one little bit. Bill then suggested that I should ask Zelotese, who had lived in the area all his life, and who would probably know what I was talking about, not least because he was distanrly related to one of the two people I was looking for. In fact, he is akin to just about anyone living in the area, but it's a completely different story. After breakfast I packed my suitcase and my car and said a warm goodbye to Rose. She had told me that she would probably put the place up for sale, which I was sorry to hear, but she comforted me when she said that it would probably take a few years to sell it, and in that time she would keep it open. And should it happen before I came back, I would always be welcome in the house she wanted to move into when the B&B was sold. That is hospitality that matters! (As the house is not sold yet, I have already booken a room for my next visit in April, and with a little luck I can stay there as well in July 2019). As Bill owns a company, he got his accommodation at a "corporate rate", and so did I! As long as Rose runs this place, I can only recommend it to anyone who happens to visit Lenoir. But for now we left the place, and with Bill’s Prius leading the way, we headed for Beaver Creek and Zelotese's home. However, when we reached Ferguson, Bill left the highway, and of course I followed. He parked next to a small restaurant, The Grocery Basket, where I had a burger a few years ago, but without knowing who was serving. Had I known it then, I would probably have been stayed a little longer. It wasn't for food that we visited the place though, but Bill would introduce me to the proprietor, Margie Dula, who is a descendant of Tom Dooley's brother, William. She had her own story of why the name changed from Dula to Dooley, but I'm still not convinced J. When we had said “hello” and had been duly photographed, we continued to Beaver Creek, where Zelotese received us with enthusiasm. 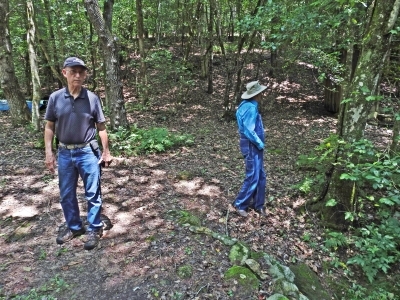 Bill (left) and Zelotese (right) in the woods near the place where Laura's body was found. Zelotese Walsh is 94! An older man, but certainly not old! Charlotte had told me that since our last visit, he had lost his wife, and he told himself that it had happened a few days before their 70th wedding anniversary, but since everything about the party had been arranged, he had held the party anyway, now just as a birthday party. Bill asked how he had met his wife, and then we got the whole very interesting story, but it is not for me to tell here. Along the way, Zelotese also told us about his experiences in the Pacific during World War II, where he participated in the Battle of Iwo Jima. Even so many years later, it was very hard for him to tell this story as so many of his comrades died there. When we had talked for a few hours, or so, Bill reminded me of what I wanted to ask Zelotese, and of course he knew where to find the cemetery in question. But instead of just explaining the way to the place, he suggested that he could show us? We said yes and then we all went in Bill's car, with Zelotese as a guide. When we arrived at the cemetery, I could easily understand why Tim and I had not been able to find it. First, it was in the woods and could not be seen from the road. Second, it was on the opposite side of Gladys Folk Road of where we had been looking for it, and also it was more than half a mile from the place where the GPS coordinates that we had found on the web, said it should be. But now that I had located the place with good help, I took some pictures, which was the reason I why I wanted to find it in the first place. Along the way, we three "young people" (Bill, Charlotte and I in that order of age) was almost worn down by a 94-old man – very impressive! By the way, Zelotese’s wife had been in a wheelchair, and after her passing away, he had kept this chair - not because he needed it, as he certainly didn’t, but it was pleasant to sit in! I might add that Zelotese lacks the right arm, and already last year he told us that he had returned from the war unharmed, only for a few years later to lose his arm in a harvester. I have told more about this in the story Two days with lots of experiences and nice people on the 2017 travel page. Zelotese also offered to show us Bates Place, the location of which I was also unaware (this was where the murder took place), so we of course said thank you to that as well. We could not get to the actual place though as the area around it is overgrown with trees and dense scrubs, but Zelotese pointed and said, "it's about 300 yards in that direction", so now I also know this. We also visited Ann Melton's grave and I was told where several of the people from the case had lived. Finally, Zelotese showed us the place where Laura's body was found, and he also clarified, which ridge is the real "Laura Foster Ridge", as it's not the one that most people claim - but it was actually the one that I supposed it was. He also told, with a not too well hidden irony, of a journalist who had contacted him to be shown around the area, and would very much like to have Zelotese point out the specific dogwood tree where Laura's horse had been tied, which was very difficult since all trees in the area in question has been felled and has grown up again several times since 1866. Eventually we returned to Zelotese's home where I thanked him very much and said goodbye for this time and a temporary farewell to Charlotte and Bill, whom I was going to meet again in the evening. The day before, I had received an email from the landlady at the B&B where I was to stay for the next three days in which she asked me when I expected to be there and I had replied that I expected to arrive between 3 and 4 pm, and as the time was now 2.30 and there was about an hour's drive to Statesville, I had to leave. I arrived in Statesville about 20 minutes to four and found my B&B easily enough, but I had also previously driven past the place a few times - though not knowing it was a B&B. 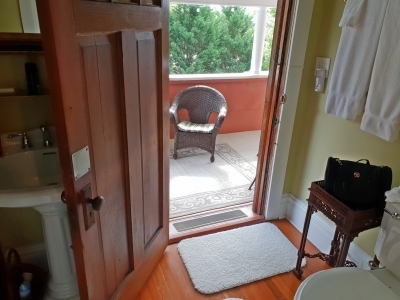 I was received by the landlady, Lori, and got my room which had a balcony outside the bathroom! I hadn't tried that before, but it was quite nice to sit out there in the evening, which I didn’t have time for until the next evening, because I had to leave again as I had to get back to Wilkesboro for the Tom Dooley show. I had seen the show in 2014, but I was looking forward to seeing it again. This time I knew one of the actors, and when I arrived (half an hour before opening hours) I was still let in, and I met Kimberly and said hello to her. A little later, Charlotte and Bill arrived and started setting up their gear. Next to their "stand," was another stand, with posters and the book "Tom Dooley - The Story Behind the Ballad", a novel by Karen David Reynolds, who had also written the play; a novel that has been on my shelf for some years. I also said hello to and had a short chat with Karen, whom I would meet again the next day. The play was excellent, actually better than the first time I saw it, even though the actors were different this time. It is, after all, "amateurs" in the best sense of the word who play the parts. Charlotte and Bill left during the break. They had seen the play before and had more than 100 miles back to their home near Charlotte. I watched the play till the end though, and as afterwards there was an opportunity to meet the actors, I went down to be photographed with Kimberly, whom I had already been photographed with the previous day, but now she was in one of her costumes (she actually played two different characters in the play) - so we reconstructed the photo from the day before I also met her husband and three children, who all three participated in the play. The husband was not an actor in the play, but did other tasks. Then I headed back to Statesville, where I arrived a little after midnight. Unlike the day before, the weather had remained dry and sunny all day with temperatures between 85 and 95 and a not too high humidity. My driving amounted to 166 miles including two trips to Statesville and one trip back to Wilkesboro.